When you pop a crémant cork on the mountainside above the valley it ricochets and echoes round the summer dusk shadows like a bullet. It silences the cow bells and the cicadas; it turns the velvet dark into something to fear. When people are shouting and calling through the fire on the other face of the valley, you hear muffled gutteral cries and you can pick out the occasional moving figure backlit by fire. I conclude that to be in the Vallée de Munster in early 1915 when human tragedies were unfolding nightly must have been petrifying. This is where I’m talking about, and my standpoint is near Luttenbach. Almost opposite, the village of Breitenbach is at the foot of one of those places whose names reverberate dreadfully down the decades from the Great War: Reichackerkopf. 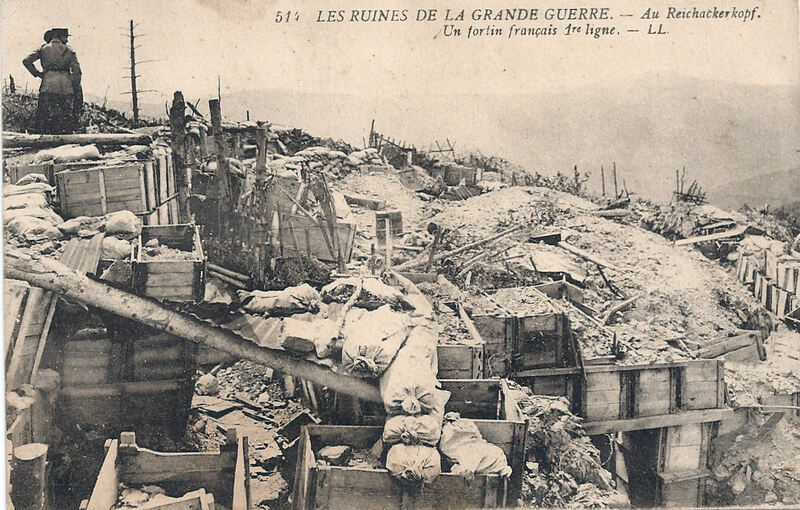 In 1915, eight thousand French and German men died in attack–counter attack, loses-gains-losses, in snow and thaw and snow, for this strategically vital piece of landscape, which controlled the access up the two prongs of the valley. 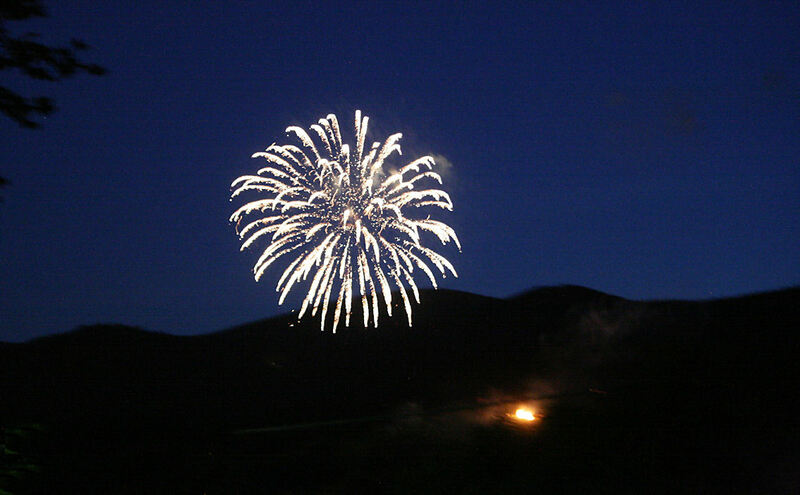 But today… today there are still numerous vestiges of the ghastly war high on this desolate mountain, and today in Alsace is the summer solstice festival, le Feu de la Saint-Jean. 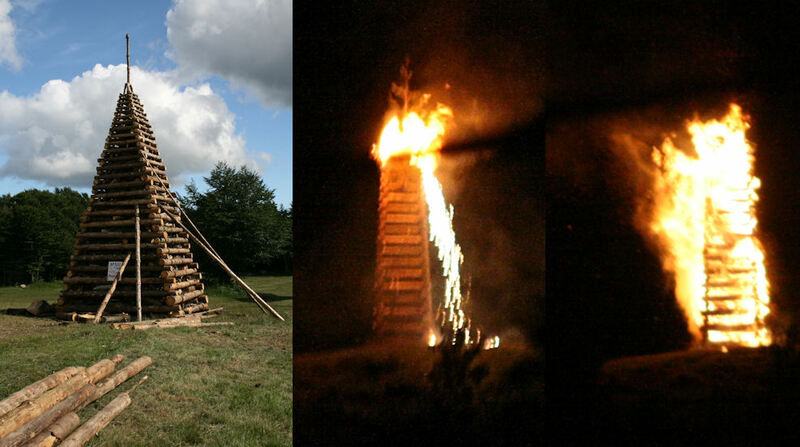 Huge structured bûchers, pyramidal pyres of wood, are constructed and burned. 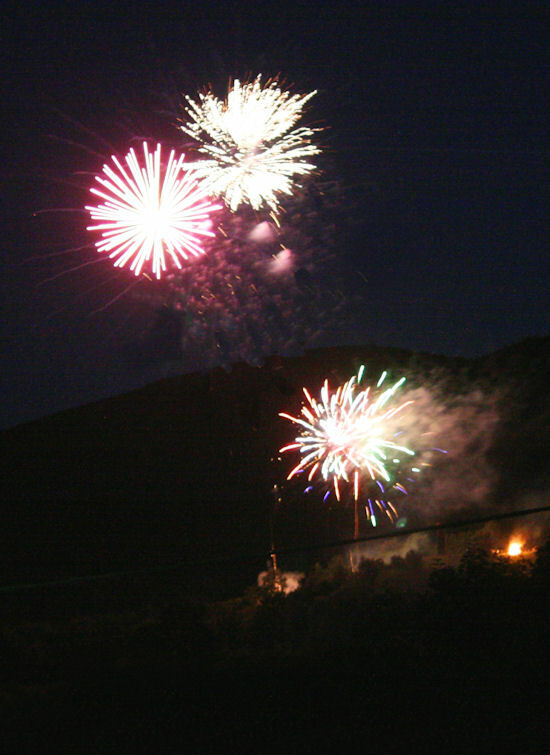 The pyres may be up to eighteen metres high and you can see them for miles. I’ve combined three images to show this. 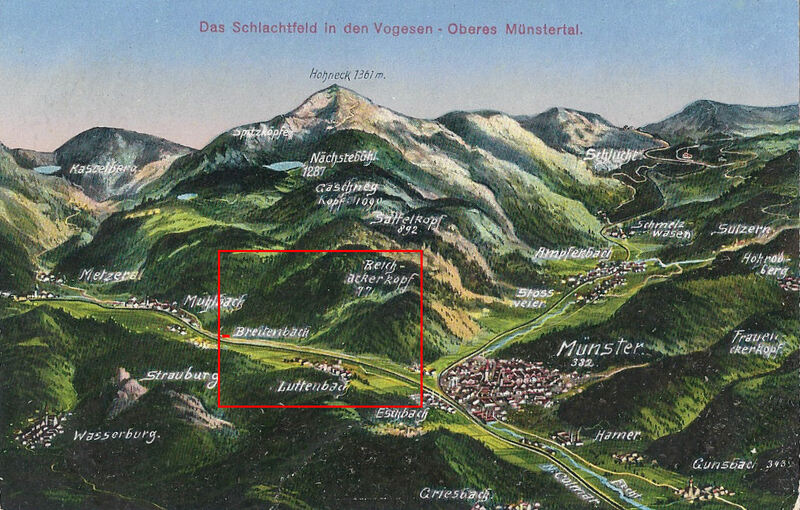 The unburnt bûcher is at the top of the Ballon d’Alsace and the burning ones – grainy because they were taken with a long lens across the valley in the dark – are above Breitenbach. Photographs of Reichackerkopf in 1915 record an utterly disfigured landscape, sometimes with clouds of smoke hanging low in the air above the previous night’s devastation. 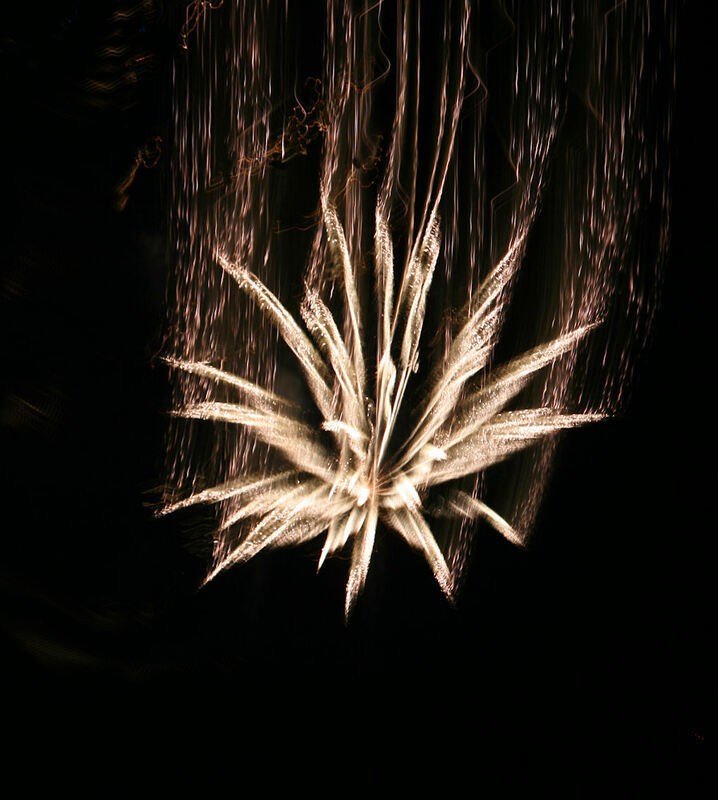 There are explosions over Reichackerkopf tonight. Combustible packets are sent into the air to ignite and shower the landscape with tiny fragments of burning material. Phantom figures run and prance in a mad choreography in front of the fire. The hillside, charcoal, merges into the indigo sky at the horizon and the flare of the sky-fires gives a lightning-brief stream of light. I’ve walked up Reichackerkopf, I’ve seen the rusty relics of soldiers’ lives, their buckets their buckles their spades; I’ve explored the derelict shelters, the rocky trenches, the fossilised sandbags which sheltered mens’ lives and the tangled tin, the torn shrapnel, the hefted rocks which killled them; and while I’m eavesdropping on the firework celebrations, I feel as if I’m eavesdropping on two happenings ninety seven years apart. *The two postcards are mine.